NASHVILLE — Vice President Mike Pence praised President Donald Trump as the "most pro-life president in American history" and said Democrats have grown out of touch with most Americans on the issue of abortion. Speaking at a luncheon in Nashville, Tennessee, hosted by the Susan B. Anthony List & Life Institute, a pro-life organization, Pence brought greetings from President Trump and emphasized that under his administration, "life is winning in America." "Think about it," he said. "From the very first day of this administration, President Trump has been keeping his word, standing without apology for the sanctity of human life. A president that, in our first week, reinstated the Mexico City Policy to prevent American tax dollars from funding organizations that promote or perform abortions beyond our borders and in fact expanded the policy to cover nearly 9 billion dollars in foreign aid." "An administration," he continued, "that stopped U.S. funding of the United Nations Population Fund so American taxpayers are no longer forced to support abortion around the world." Pence recalled how last year he cast the tie-breaking vote that passed an anti-Planned Parenthood bill which allows states to withhold federal funds from Planned Parenthood and pro-abortion organizations. The VP reminded audiences that during the 2018 March for Life, President Trump promised to "always defend the very first right in the Declaration of Independence, and that is the 'right to life.'" "And I can assure the president is keeping that word every single day," he said, pointing out that Trump has surrounded himself with men and women who will uphold the God-given liberties outlined in the U.S. Constitution. "I really do believe that life is winning in America for a variety of reasons," Pence said. "Life is winning through the generosity of millions of adoptive families that are opening their homes to children. Life is winning through the caregivers and volunteers at crisis pregnancy centers and faith-based organizations that are coming alongside young women with crisis pregnancy with support and with love and encouragement." "I couldn't be more proud of the deep compassion of the pro-life movement and the continued commitment to be there to love them both," he said. While the nation has made "great progress," we have "much work yet to do," Pence emphasized. "Truth is that the opposition is always looking for ways to undo our achievements, notably in the category of the progress that we've made in the cause of life," he said, noting that "nearly every Democrat" recently voted against the Pain-Capable Unborn Child Protection Act, a bill to ban late-term abortions nationwide after 20 weeks. "The other party continues to go farther and farther to the left, even while Americans, especially younger Americans, are choosing and embracing the sanctity of life more and more everyday, and we have to be their voice," Pence said. 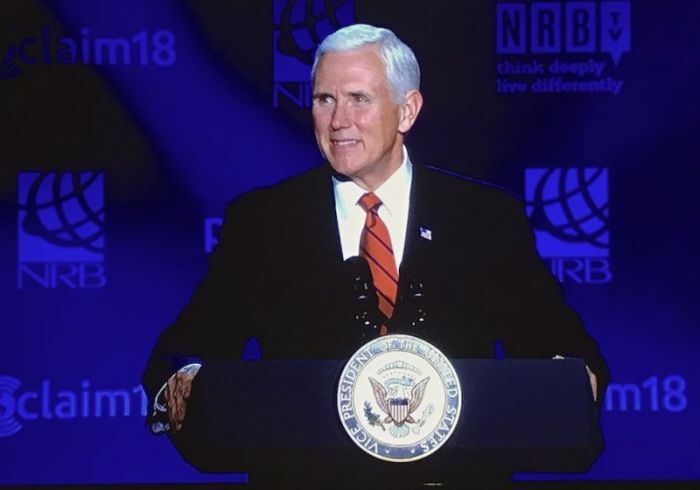 Closing his address, Pence challenged attendees to "continue to speak about the cause of life on every platform that you have an opportunity to address." "I truly do believe that if all of us do all we can, then we will once again in our time restore the sanctity of life to the center of American law," he said. "Let's not grow weary in doing good ... this will be the generation that restores life in America." "Good news is around the corner in America. I have boundless faith in the goodness and decency of the American people, I have boundless confidence in the president that you elected, and the pro-life majorities in the Congress of the United States and states all across this country. And I have boundless confidence in Him who said, 'Before I formed you in the womb I knew you.'" Pence was introduced by Marjorie Dannenfelser, president of the Susan B. Anthony List, who praised the vice president for putting pro-life issues at the center of his political career. "I want to introduce you to a man who understands the power of the least of these," she said, adding that Pence "is the kind of man who looks forward to hearing the words 'well done my good and faithful servant' more than he does the pat on the back he'll get along the way." "It's the kind of man that is bound more than by the Word of God and Karen than the word of The New York Times or the words of The Washington Post or the words of political consultants. It's the kind of man who keeps his promises," she said. "It's the kind of man who slays the Planned Parenthood dragon before it's cool, before anyone was talking about it." Pence, she said, is the kind of man who "draws the line in the sand about where we must and cannot go when it comes to life." "In the face of the great moral evil of our time, Mike Pence has not been silent," she said. "He has not backed down, he has with energy and wisdom and eloquence and integrity made his voice heard on behalf of the defenseless child and the vulnerable mother who needs him." The Susan B. Anthony List & Life Institute luncheon was part of the annual National Religious Broadcasters convention, Proclaim 18, which is meeting this week at the Gaylord Opryland Resort & Convention Center.